Der neue Online-Marktplatz: Geschäftspartnersuche leicht gemacht! Call for goShanghai 2019 powered by GIN is open – apply NOW! The Global Incubator Network Austria – short GIN – is looking for Austrian later-stage startups for their next goAsia accelerator program goShanghai 2019 powered by GIN – The call for applications is open now! goShanghai with a breakout session to the Mobile World Congress (MWC19) is a unique 2-week accelerator program for Austrian later-stage startups that want to cross borders and aim to enter the Asian market. GIN refunds 80% of all expenses as well as accommodation and travel cost up to EUR 7,000 per startup. 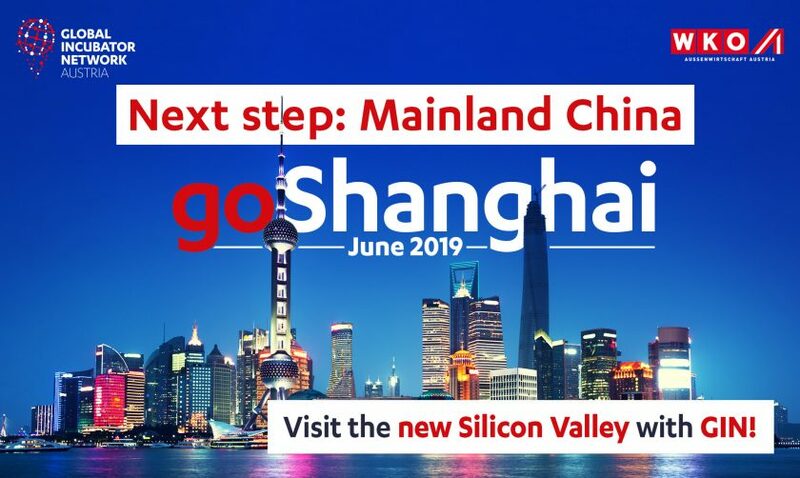 In June 2019 the Global Incubator Network Austria in collaboration with the Austrian Trade Commission (AußenwirtschaftsCenter Shanghai) gives up to 8 selected startups the amazing opportunity to enter Mainland China and to explore the new Silicon Valley Shanghai. GIN supports Austrian later-stage startups in their internationalization plans with extensive hands-on experience, customized networking opportunities and unique business connections. More information on the program can be found in the download area. If you have any further questions, please do not hesitate to contact GIN directly at goasia@gin-austria.com.